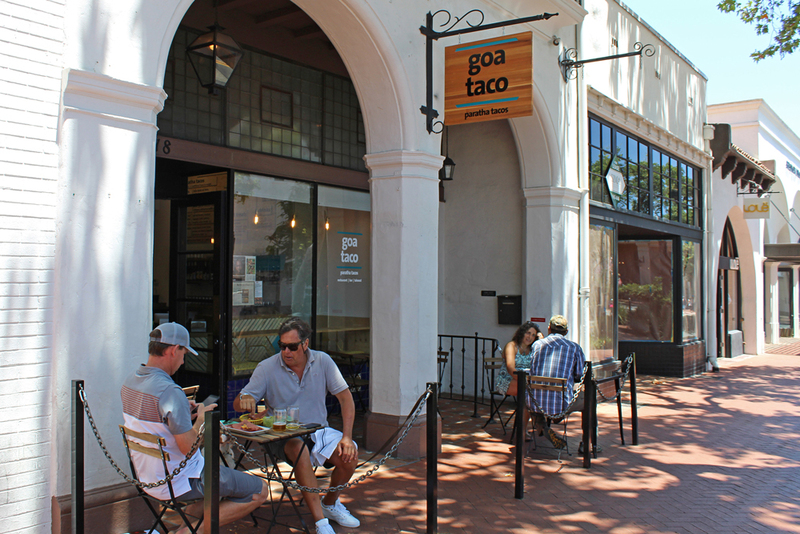 Tacos can be found in any number of places in Santa Barbara, but likely only one serves them in paratha, an Indian flatbread. Originally from New York, the restaurant serves tacos inspired by South Asian and Mediterranean flavors. Once a Brooklyn food market stand, Goa Taco picked up rave reviews in its hometown publications, and migrated to two Manhattan shops of 200-to-300 square feet, before adding a weekly pop up at Los Angeles’ Smorgasburg food market. Goa Taco takes over the spot of the former Gandolfo’s New York Deli, which closed late last year. Marneweck’s new digs are like a mansion compared to his East Coast establishments. “We figured out here, I wanted to do something a little bit bigger where it can fit the slow-paced life out here, where people can sit down, take their time or just come in for a drink,” the native of South Africa told Noozhawk. With a business partner taking care of his New York operations, Marneweck moved out west to focus on his new venture, which has been a hectic, non-stop process. “I’m definitely here 24/8,” he said.